Interested in making a recipe that calls for cake flour? If you don't have any, and don't want to buy any, this simple substitute will do just fine. It requires just two pantry staples. Check it out. 2. Fill the rest of the cup with all-purpose flour. 3. Use your substitute in place of the cake flour called for in any recipe. One cup of substitute is equal to one cup of cake flour. Scale the recipe up or down as needed to suit your needs. Note: Most store-bought cake flour is bleached (King Arthur is one of the only brands to sell an unbleached version), so while you may be looking for a substitute today because you don't have any cake flour on hand, you may find it preferable to continue using this substitute, if you are trying to avoid bleached flours. When you add a small amount of cornstarch to the flour, it counteracts some of the protein in the all-purpose flour, so your cake turns out more tender. It won't be quite the same as cake flour, but it will give you a lighter cake, with a tighter crumb. What Is Cake Flour Anyway? As the name suggests, it's a flour that's used for making cakes. It has a slightly lower protein content than all-purpose flour — 8-9 percent, compared to 11 percent — and while that may not sound like a lot, it's enough to change the texture and crumb of a cake in subtle ways that matter (at least to master bakers). Cakes made with cake flour tend to have a finer, lighter texture and a smaller crumb than those made with all-purpose flour. But cake flour is not nearly as essential as some bakers would lead you to believe. Home bakers have been making cakes with all-purpose flour since the beginning of time, and there's no reason to stop now. Whip up a cake with all-purpose flour, and it may have a slightly larger crumb and be the teeny tiniest bit more dense than one made with cake flour. But really, if it still tastes the same, who cares? As far as I'm concerned, someone who's going to judge the size of your crumb is someone you shouldn't bother sharing your cake with. Can't I Just Use All-Purpose Flour? As long as you don't mind subtle changes in texture, there's no reason you can't make the swap. As a general rule, you'll probably notice the change more in something like an angel food cake, than you would in a cupcake recipe. If you plan to pile on the frosting, or to make a multi-layer cake, you may even find that the slightly sturdier quality of a cake made with all-purpose flour actually works to your advantage. Cornstarch is the same thing as corn flour. Just don't make the mistake of using corn meal in this recipe. It's a completely different product, and won't give you the desired result. Cake flour contains less gluten than all-purpose flour, but it isn't gluten-free. If you're baking for someone with gluten intolerance or Celiac Disease, you should substitute the flour called for in your recipe with gluten-free flour. For the best results, use a product that's designed for one-to-one substitution. This will save you a bunch of tricky math, and increase your chance of getting a good result. If you don't want your cakes to turn out dense, learn how to measure your flour properly. That simple skill will do more for your cakes than any specialty flour ever will. Most people make the mistake of digging their measuring cup into the bag of flour. And while that's admittedly quick and easy, it packs extra flour into the cup. 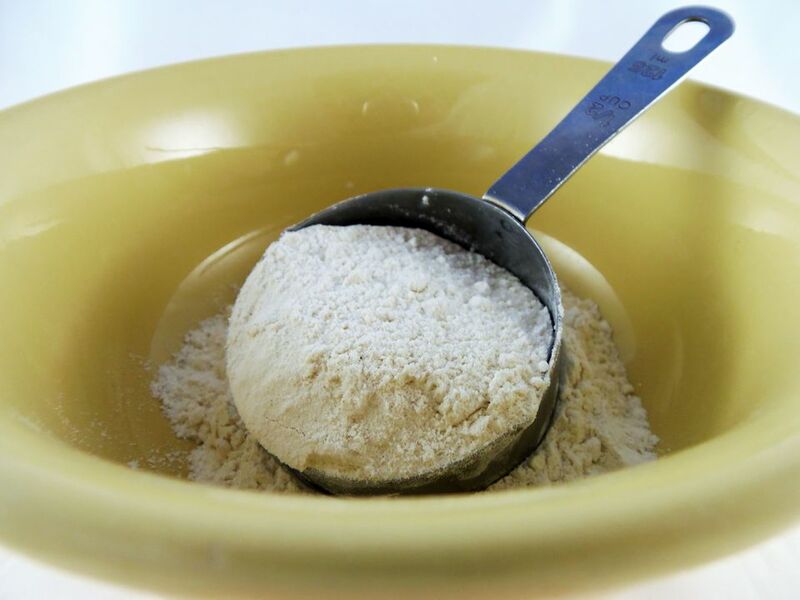 Use a spoon to measure flour into your measuring cup. Then, level it off with the back of a knife, before you add it to your recipe. That'll ensure that you're using the amount of flour intended by the recipe's author.